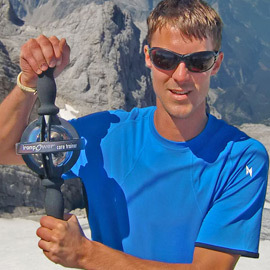 DFX Pro Staffer Korbinian Kern is a climber and mountaineer based in Bavaria, Southern Germany. He is involved as a mountain guide with the DAV German Mountain Association leading other climbers into the Alps on climbing and hiking tours specializing in ice and snow conditions. He has climbed many of the most famous peaks in the Alps (France, Switzerland, Germany and Austria) including Mont Blanc, the Alp’s highest peak. He has also climbed Kilimanjaro in Kenya, and participated in the Dhaulagiri Circle Expedition in Nepal. Korbinian’s day job is as an engineer with Schrader LTD where he is involved in international projects developing brake system on cars. His specific project focus is with BMW, and says that driving their vehicles is a perk!